Draft: 2008, Detroit Tigers, 5th rd. Married to Kristina…has 2 children: Avery and Zoey. Played in 80 games in his first season with Arizona, hitting .165 with 6 doubles, 7 home runs and 20 RBI...His 30.0-caught stealing pct. was his second best since 2011, trailing only his 32.3 pct. in 2015, and finished fifth in the NL (min. 50 games)...Had an .824 OPS with 6 doubles, 5 home runs, 16 RBI and 22 walks in his last 36 games after June 21. Combined to hit .264 AVG/.387 OBP/.447 SLG with 13 doubles, 14 home runs, 49 RBI and 62 walks in 112 games with the Tigers and Cubs ... Started 70 games at catcher and 11 at first base…batted .270 AVG/.398 OBP/.478 SLG vs. right-handers ... Tied for second among all catchers with 45 walks (also: Jason Castro), while his .361 OBP ranked fourth (min. 250 PA) ... Traded to Cubs with LHP Justin Wilson on July 31 for INF Jeimer Candelario, INF Isaac Paredes and a player to be named later or cash considerations ... Notched a walk-off, 2-run single in the 10th inning on Aug. 20 vs. Blue Jays. Limited to 57 games in 2016 with Chicago (AL) due to two separate stints on the disabled list... Sidelined from April 24-May 9 with a right hamstring strain... Began an injury rehabilitation assignment with Triple A Charlotte on May 6 -- appeared in three games and went 0x8... Went 1x3 with a double on June 3 at Detroit, his first game as a visiting player at Comerica Park...Hit a pair of home runs off Ian Kennedy on June 10 vs. Kansas City for his fifth career multi-homer game...was his first multihomer game since September 15, 2013 vs. Kansas City... Recorded the third four-hit game of his career on June 23 at Boston, going 4x5. Finished the month of June with a .288 (15x52) batting average with six runs scored, two doubles, three home runs and four RBI... Sidelined from July 6-August 26 with a right hamstring strain... Began an injury rehabilitation assignment with Triple A Charlotte on July 18 -- played in two games before having his injury rehab assignment recalled and remaining on the disabled list... Began an injury rehabilitation assignment with Triple A Charlotte on August 22 -- appeared in four games and hit .636 (7x11) with three runs scored, one home run and three RBI... Walked multiple times in four of his final 10 games, including tying a career high with three walks on September 27 vs. Tampa Bay. Was limited to just 67 games due to injury in his sixth full season with Detroit. Appeared in 44 games (43 starts) at catcher and 23 (13) at first base … committed just one error between the two positions (439 total chances). Threw out 32.3 percent (10-31) of attempted basestealers … pitchers owned a 4.55 ERA (185 ER/365.2 IC) when he was behind the plate. Batted .260 (19-73) at Comerica Park, compared to .143 (15-105) on the road … hit three of his four home runs before the All-Star Break. Connected on his first career Opening Day home run on 4/6 vs. Minnesota, a two-run shot in the second off Phil Hughes … scored a career-high four runs and tied a career high with three walks on 4/8 vs. the Twins. Was on the disabled list from 5/7-7/3 due to a loose body in his left knee … appeared in six games with Class AAA Toledo during a rehab assignment. Completed his fifth season as the Tigers starting catcher in 2014, appearing in 124 games with the club...Led the American League with 36 runners caught stealing, while he finished second with 26 catcher caught stealing...Connected for a season-best three hits on April 22 at u.s. Cellular Field -- equaled the high on June 24 at Texas and August 2 versus Colorado...Batted .284 (19x67) with nine runs scored, four doubles, one home run and five RBI during June...Knocked a season-high three rBI on July 12 at Kansas City -- matched the high on July 23 at Arizona...Hit the 100th double of his career on July 23 at Arizona...Made his first career appearance at first base on August 22 at Minnesota...Connected for a walk-off rBI single in the ninth inning on August 28 versus the Yankees -- marked the third walk-off hit of his career...Posted a .262 batting average (45x172) with six home runs and 26 rBI in 54 games against opponents from the American League Central Division...Batted .226 (24x106) with 12 RBI against lefthanded pitching, while he posted a .215 batting average (61x284) and 35 RBI with righties on the mound...Hit .202 (42x208) in 68 games at Comerica Park...batted .236 (43x182) in 56 games on the road...Posted a .230 batting average (52x226) with seven home runs and 24 rBI in 73 games prior to the All-star break...hit .201 (33x164) with four home runs and 23 rBI in 51 games following the break...Threw out 26.8 percent of baserunners attempting to steal (26x97). Completed his fourth full season with the Tigers in 2013, seeing action in 102 games with the club...Sidelined June 17-July 2 with a left forearm contusion...Assigned to Triple A Toledo for an injury rehabilitation assignment on June 23 -- hit .242 (8x33) with three runs scored, two doubles, one home run and five RBI in eight games with Toledo...Belted his first career grand slam on July 30 versus Washington off Stephen Strasburg -- drove in a season-high four runs that same game...Compiled a season-high six-game hitting streak July 24-31, batting .348 (8x23) with two doubles, two home runs and nine RBI during the streak...Hit .269 (18x67) with four doubles, three home runs and 19 RBI during July...Sidelined August 11-24 with delayed concussive symptoms...Assigned to Toledo for an injury rehabilitation assignment on August 22 -- batted .273 (3x11) with two runs scored and a double in four games with the Mud Hens...Matched a career-high with four hits on September 10 at Chicago...Hit .343 (23x67) with four doubles, two home runs and eight RBI during September--ranked third in the American League with a .343 average and a .430 on-base percentage during that stretch...Hit .139 (11x79) with lefthanders on the mound...while he batted .255 (64x251) against righties...Recorded a .259 batting average (38x147) at home...posted a .202 (37x183) average on the road...Batted .177 with five doubles, six home runs and 21 RBI prior to the All-Star break...batted .296 (37x125) with eight doubles, five home runs and 24 RBI after the break...Threw out 12.0 percent of baserunners attempting to steal (10x83). Finished his second season as the Tigers starting catcher in 2012, seeing action in 116 games with the club ... Third among all American League catchers by throwing out 26.2 percent of baserunners attempting to steal (28x107) ... Belted his first career walk-off home run on April 8 versus Boston, a two-run shot off Mark Melancon in the 11th inning ... Collected a season-high three hits on May 4 versus the Chicago White Sox -- equaled the high with three hits on June27 at Texas and September 15 at Cleveland ... Drove in a season-best three runs on May 22 at Cleveland -- matched the best with three RBI on May 25 at Minnesota ... Sidelined June 6-21 with a right hamstring strain ... Assigned to Triple A Toledo for an injury rehabilitation assignment on June 18 -- hit .429 (3x7) with an RBI in threegames with Toledo ... Posted an 11-game hitting streak July 30-August 10, batting .457 (16x35) with four doubles, a home run and eight RBI ... Batted .262 (74x282) versus righthanded pitchers...hit .176 (15x85) with lefties on the mound. Completed his first season as Detroit's starting catcher in 2011, establishing career bests in nearly every offensive category as he earned his first Silver Slugger Award...Fifth in the American League with a .389 on-base percentage...Led all American League catchers with a .292 batting average, 130 hits, 32 doubles, 77 RBI and a .503 slugging percentage while catching, while he tied for fourth with 18 home runs...Selected as the American League's starting catcher for the Major League Baseball All-Star Game held in Phoenix, his first career all-star selection -- became the fifth catcher in Tigers history to start in the All-Star Game, joining Birdie Tebbetts, Bill Freehan, Lance Parrish and Ivan Rodriguez...Named to The Sporting News' American League all-star squad following the season...Topped all American League catchers with 1,018 total chances and 940 putouts, while he finished second with a .995 fielding percentage and 73 assists...Tabbed the third-best defensive catcher in the American League by Baseball America...Established a career best with five RBI on April 6 at Baltimore -- marked the most RBI by a Tigers catcher since Ivan Rodriguez also drove in five runs on June 15, 2007 at Philadelphia...Batted .329 (23x70) with six doubles, a triple, three home runs and 18 RBI in 21 games during April...Connected for two home runs on May 2 versus the New York Yankees to match a career best -- equaled the best with two home runs on May 24 versus Tampa Bay...became the first Tigers catcher with multiple multi-home run games in a season since John Flaherty also posted two such games during the 1995 season...Collected a career-high two triples on June 9 versus Seattle -- became just the third Tigers catcher to finish with two triples in a game since at least 1919, joining Lance Parrish (September 27, 1980 versus New York Yankees) and Brad Ausmus (July 6, 1999 versus New York Yankees)...Batted .346 (27x78) with six doubles, two triples, two home runs and 17 RBI in 24 games during June...Compiled a 10-game hitting streak August 2-13, batting .400 (14x35) with two doubles, three home runs and eight RBI...Established a career high with a 12-game hitting streak August 15-28 -- batted .419 (18x43) with five doubles, a triple, four home runs and nine RBI during the streak...marked his second hitting streak of 10 games-or-better during August and he became the first Tigers player to have two such hitting streaks in the same month since Roger Cedeno posted two 10-game hitting streaks in May of 2001...Tabbed the Tigers Player of the Month for August after hitting .360 (32x89) with seven doubles, a triple, seven home runs and 18 RBI in 26 games -- third in the American League with a .697 slugging percentage during the month, while he was fourth with a .472 on-base percentage, seventh with a .360 batting average and tied for eighth with seven home runs...Established a career high with four hits on September 4 versus the Chicago White Sox...Hit .304 (102x336) against righthanded pitchers...batted .273 (35x128) with lefties on the mound. Completed his first full season at the major league level with the Tigers in 2010....Threw out 31.7 percent of runners attempting to steal (20x63), second among American League catchers....Belted two home runs on May 5 at Minnesota to establish a career high....Established a career high with three hits on June 11 versus Pittsburgh -- equaled the high with three hits on September20 versus Kansas City and September 25 versus Minnesota....Compiled a career-best five-game hitting streak June 11-19, batting .529 (9x17) with a double, home run and eight RBI....Batted .306 (15x49) in 17 games during June....Connected for a two-run home run in the ninth inning on August 14 at Chicago's U.S. Cellular Field to lead the Tigersto a 3-2 win over the White Sox -- according to the Elias Sports Bureau, he was the first Tigers rookie catcher with agame-winning home run in the ninth inning-or-later since Lance Parrish belted a walk-off home run in the 16th inningoff Seattle's Shane Rawley on May 16, 1978....Hit .302 (19x63) in 21 games during September. Spent the first four months of the 2009 season with Double A Erie before having his contract purchased by the Tigerson August 5 and receiving his first major league action...Selected to the Eastern League's mid-season all-star squad...Threw out 43.6 percent of baserunners attempting to steal (34x78) with Erie, tops in the Eastern League...Hit .415 (17x41) with four doubles, two home runs and nine RBI over an 11-game stretch May 20-June 2...Batted .377 (23x61) with six doubles, three home runs and 17 RBI over an 18-game stretch June 20-July 8...Collected a season-high three home runs and seven RBI for Erie on July 24 versus Binghamton...Tied for fifth in the Eastern League with six home runs during July...Made his major league debut with the Tigers on August 6 versus Baltimore -- doubled and drove in a run in the thirdinning off David Hernandez for his first major league hit...finished with two hits to become the first Tigers player tocollect two-or-more hits in his major league debut since Brent Clevlen did so on July 30, 2006 at Minnesota...Connected for his first major league home run on August 7 versus Minnesota, a two-run shot in the first inning offAnthony Swarzak -- collected a career-high four RBI in the game...marked his second straight game with two hits andat least one RBI...according to the Elias Sports Bureau, he became the first Tigers player to collect at least two hits andone RBI in both of his first two major league games since Dale Alexander did so during the 1929 season...Added two hits in his third career game on August 11 at Boston to become the first Tigers player since at least 1954 tobegin his major league career with at least two hits in each of his first three games...Hit .324 (12x37) with four doubles, three home runs and nine RBI in 14 games during August -- tied for fourth amongall American League rookies with three home runs during the month...Batted .400 (4x10) versus lefthanded pitchers with the Tigers...hit .255 (13x51) with righties on the mound...Hit .368 (14x38) in 17 games at home...batted .130 (3x23) in 12 games on the road...Named the sixth-best prospect and best defensive catcher in the Tigers organization following the season by BaseballAmerica...Saw action in 15 games for Escogido in the Dominican Winter League following the season, batting .140 (7x50) with adouble and three RBI. Made his professional debut with Single A West Michigan after being selected by the Tigers in the fifth round of the June 2008 draft...Collected a season-high three hits on July 4 versus Fort Wayne -- matched the high with three hits on July 19 at Burlington and August 19 at South Bend...Tied for 10th in the Midwest League with a .337 batting average (30x89) in 24 games during July...Drove in a season-high four runs on August 19 at South Bend...Batted .326 (29x89) with nine doubles, a home run and 12 RBI in 24 games during August -- seventh in the Midwest League with a .326 batting average during the month...Played in all three of West Michigan's games during the Midwest League playoffs, hitting .182 (2x11) with three RBI. 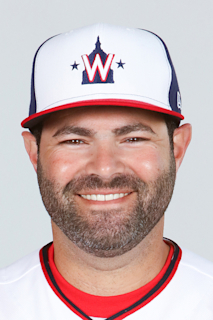 April 7, 2019 Arizona Diamondbacks placed C Alex Avila on the 10-day injured list. Strained left quadriceps. July 7, 2018 Arizona Diamondbacks activated C Alex Avila from the 10-day disabled list. June 27, 2018 Arizona Diamondbacks placed C Alex Avila on the 10-day disabled list retroactive to June 24, 2018. Strained right hamstring. January 31, 2018 Arizona Diamondbacks signed free agent C Alex Avila. November 2, 2017 C Alex Avila elected free agency. August 1, 2017 Chicago Cubs activated C Alex Avila. July 31, 2017 Detroit Tigers traded C Alex Avila and LHP Justin Wilson to Chicago Cubs for Player To Be Named Later, SS Isaac Paredes and 3B Jeimer Candelario. December 23, 2016 Detroit Tigers signed free agent C Alex Avila. November 3, 2016 C Alex Avila elected free agency. August 26, 2016 Chicago White Sox activated C Alex Avila from the 15-day disabled list. August 22, 2016 Chicago White Sox sent C Alex Avila on a rehab assignment to Charlotte Knights. July 18, 2016 Chicago White Sox sent C Alex Avila on a rehab assignment to Charlotte Knights. July 6, 2016 Chicago White Sox placed C Alex Avila on the 15-day disabled list. Strained right hamstring. May 9, 2016 Chicago White Sox activated C Alex Avila from the 15-day disabled list. May 6, 2016 Chicago White Sox sent C Alex Avila on a rehab assignment to Charlotte Knights. November 25, 2015 Chicago White Sox signed free agent C Alex Avila. November 2, 2015 C Alex Avila elected free agency. July 3, 2015 Detroit Tigers activated C Alex Avila from the 15-day disabled list. June 26, 2015 Detroit Tigers sent C Alex Avila on a rehab assignment to Toledo Mud Hens. August 27, 2013 Detroit Tigers activated C Alex Avila from the 15-day disabled list. August 25, 2013 Detroit Tigers placed C Alex Avila on the 15-day disabled list. Delayed concussive symptoms. August 22, 2013 Detroit Tigers sent C Alex Avila on a rehab assignment to Toledo Mud Hens. August 12, 2013 Detroit Tigers placed C Alex Avila on the 7-day disabled list retroactive to August 11, 2013. Delayed concussive symptoms. July 2, 2013 Detroit Tigers activated C Alex Avila from the 15-day disabled list. June 23, 2013 Detroit Tigers sent C Alex Avila on a rehab assignment to Toledo Mud Hens. June 17, 2013 Detroit Tigers placed C Alex Avila on the 15-day disabled list. Left forearm injury. June 21, 2012 Detroit Tigers activated C Alex Avila from the 15-day disabled list. June 18, 2012 sent C Alex Avila on a rehab assignment to Toledo Mud Hens. June 6, 2012 Detroit Tigers placed C Alex Avila on the 15-day disabled list. Right hamstring strain. October 17, 2009 C Alex Avila assigned to Leones del Escogido. August 5, 2009 Detroit Tigers selected the contract of C Alex Avila from Erie SeaWolves.